This image of Neptune from Voyager 2 has been a favorite of mine since I was a kid. While it lacks the hi-resolution quality coming from Cassini and HI-RISE, it still remains one of the greatest portraits from our Solar System. In fact I partly blame this picture for getting me interested in astronomy as a kid. 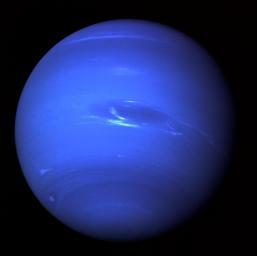 It’s such a shame to think that Neptune’s only earthly visitor was Voyager 2. Maybe New Horizons will snap some pictures on it’s way out to Pluto?